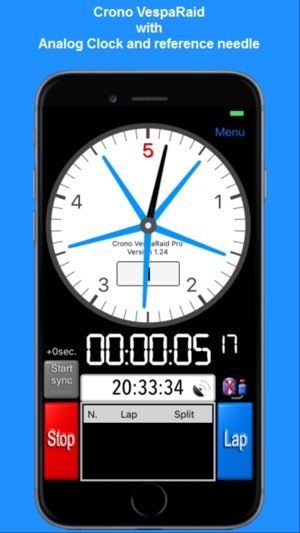 This App is the only analog stopwatch for uniformity rally for motorcycles. CronoVespaRaid was conceived and is used by the best profis in the sector, such as the Italian champion Deris Franzini. 4. Layout with 10 arranged circles clockwise - each circle corresponds to one tenth of a second. On Clicking on a circle changes the color to red, so one has a reference immediately with a look. The advantage of a Analog Stopwatch compared to digital is the ability to see with one eye cents pass, whereas with a digital chronograph is impossible to the human eye. 1. Manually, using as a reference the time of the organizers. 2. The atomic time, using one of the many global or regional server. 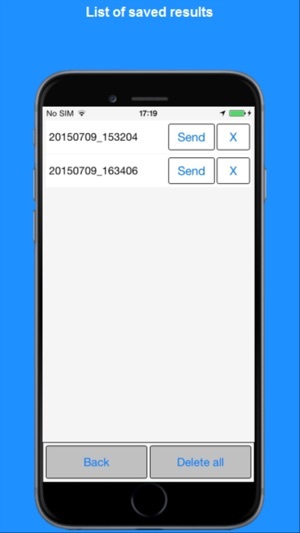 With this selection, the synchronization is performed with the clock at regular intervals, so an internet connection should always be present. 3. GPS, using the satellite time. With this selection, the synchronization is done with the clock not only with the selection but always when a motion occurs. * il Software-tasto "Start" and "Lap"
The button works with all iPad e iPhone. Important! A photocell can at the input for the button to be connected (the contact is open). * The term of the analog clock is limited to only 1 minute!